Last week on Dave’s “What to Sell on Amazon” series, I covered Magic: the Gathering; because, hey! I’m a big ol’ hobby geek and I’m not afraid to admit it. So, now it’s time to look at the other end of the product spectrum with weight lifting products. Why do you want to filter out some of the bigger sellers? Because these are your competition after all… If you take them out would it not give you an unrealistic opportunity score? Good question. When you filter out the big competitors, it readjusts the numbers. Say you’re looking at a product opportunity that has one big seller in it… say Cuisinart or something. They’re doing 4,000 monthly sales. They’re making it seem like average monthly sales are 500/month. Then, when you remove them, it switches to 250/month. If I went with the version that has Cuisinart, I’d buy products thinking I’m going to do 500/month sales, when in reality it’s going to be only 250. Often, you can see opportunities go from high (7+) to lower (6 or less). On the other hand, sometimes an outlier can make a product seem like a no go, when in reality it’s strong so long as you can create a new variation. And that brings me to my point: The only time you should really consider the big competitors in a category is if the product you hope to sell is TOO similar to the big guys’. For example, a garlic press. Every single variation of garlic press has probably been created.and all the available profit has been eaten up by the big brand names. Therefore, it’s probably not a good idea to get into something like that. Whereas something like “mtg play mat” has some big competitors in it (obviously MTG’s actual maker), but there’s still enough variation and profit left for the smaller guys to create products there. How did I discover what to sell on Amazon? 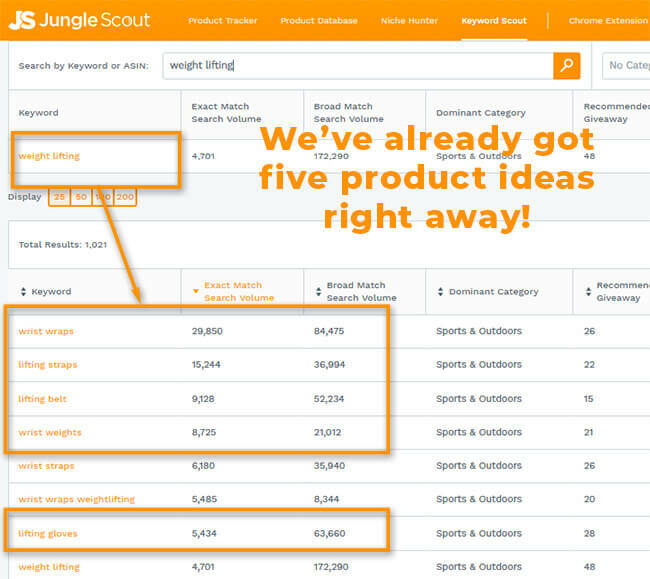 When it comes to product ideation for me lately, I’ve been using Keyword Scout. I think of a topic (like “magic the gathering” or “weight lifting”) and put it into the tool. What’s cool is that it usually spits out some good results sorted by the monthly searches. If monthly searches are high, demand is high. That was pretty quick, eh! Noticed that I skipped over “wrist straps” and “wrist wraps weightlifting.” The reason I skipped these is because they’re probably the same as wrist wraps. Of course, that’s pretty exciting to have so many searches for just one product. Now that we’ve got some ideas of what to sell on Amazon, let’s take a look at the data and determine whether or not these are products worth selling. 1,098 average units in sales per month. Huge demand! So that’s good. 801 average reviews. Whoooaaa, momma, that’s a lot of competition. Furthermore, I couldn’t even remove outliers this time as nearly every single product on the first page had over 100 reviews. That’s a bad, bad sign. $14.85 average price. Not the best price, unfortunately. FBA fees are showing $2.99. That means it’s lightweight and easy to ship, which is what we like. All right, this product is probably going to be a dud. With such a high review count for every single seller on the first page, I can all-but-guarantee it’ll be impossible to get to the first page. Regardless, let’s take a look at costs. Fortunately, they’re pretty inexpensive to manufacture. They seem to never cost more than $1.50, even for low minimum order quantities. Let’s say that we totally lost our minds and decided to go against the massive competition with this one. How many units would I need to order? Well, if average sales on the first page is just over 1,000 units, we’d probably need about 3,000 just to cover our first 90 days in sales. Additionally, we’re going to need a lot of giveaway units, too. Keyword Scout shows us that we need to give away 26 per day for at least 10 days. So that’s another 26 units. But I’d be even willing to go a bit further and suggest that you use giveaway units as sort of a constant method of advertising, until you can catch up. So possibly get 26 per day for 60 days. That’s 1,560 more units. So we probably need to order somewhere between 4500-5000 units on our first order. At that volume, we should then probably switch to by sea shipping. OnPallet.com shows us that we can probably get about 1200 of these onto a pallet, maybe even more. So we’re going to need at least four pallets. That’s probably about $750 per pallet (always check with a logistics company first, though). So we’re looking at $0.63 per unit in shipping costs. I’m guessing at that volume, we might get a discount at 20% off the MOQ price, so let’s say per unit cost is $1.20. If we sell this product for $18.50, Amazon will take $5.76 in fees (15% referral fee and $2.99 FBA fees). After subtracting cost of goods, we’re left with $10.85 for profit and ads. Here’s where competition really troubles us with this product. 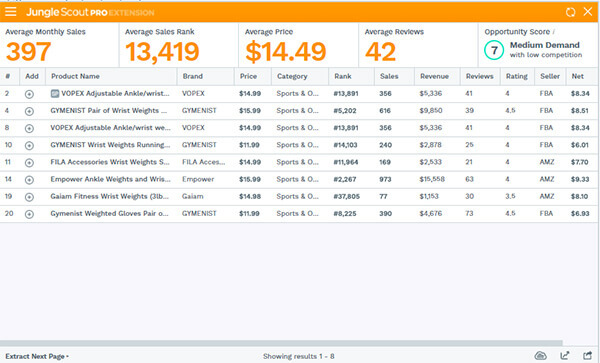 Keyword costs for wrist wraps is extremely high. Exact bids are $1.97 and broad are $1.59. Using the 2.5 Rule, we know that ads at those price range could cost us as much as $19.70 per sale. And since our price is higher than the competition, our conversion rate will probably be lower, too, especially if we lack the number of reviews that our competitors do. Looking at related keywords, it doesn’t get much better. Verdict: Incredibly high competition means you’ll spend thousands just to get your product ranking and making sales. And even then, it’s a craps shoot. Avoid this one, as it’s a loser. 1,101 average units in sales per month. Huge demand! So that’s good… but as we learned before, not all that glitters is gold. 810 average reviews. Yep. Another incredibly competitive category. $20.96 average price. Higher than before, so that’s good. As we learned with the wrist straps, high competition like this is way too tough to compete in. We can’t even remove the big guys, because they’re all big guys. Best just to call this one dead-on-arrival. Verdict: Another mega-high competition loser. By the way, this is one of the first times I’ve ever seen a “3” opportunity score. Stuff less than a 4 is pretty rare! 441 average units in sales per month. Demand is pretty good, although not as crazy as some of the other categories. $35.93 average price. A fantastic price point. That makes me happy. FBA fees are showing $4.18. I’m actually pretty surprised by this. The weight of the product in the picture is only 1.45 lbs. Way lighter than I thought it’d be! So maybe there’s some hope here? Okay, again, competition is pretty ugly here. Regardless, the higher price and low FBA fees have piqued my interest. Let’s see if there’s any way we can get into this category. After all, there are a few sub-100 review sellers on the front page. And here’s where things fall apart. Sadly, these belts are costly to manufacturer. Doing a quick look on Alibaba, looks like these belts cost roughly $15-$20 to produce at low quantities. Some even moreso. There’s some cheaper ones, but they look, cheap, too. And if we want to get close to the higher end price, we have to go with quality. While they’re light, they do take up some space, so we’re probably going to need to ship them by sea no matter what quantity we purchase. OnPallet.com shows us that we can fit about 500 onto a pallet. If I remove all the mega-competition sellers, the Chrome Extension shows us that we’ll sell 175 units per month. And Keyword Scout recommends giving 150 units away the first ten days (15 per day). So that means we need 675 units to launch right. That’s going to be two pallets worth of products. In my experience, two pallets runs roughly $1800. That adds $2.67 to our total cost. But at price points of $15, that’s not a huge hike. If we sell our belts for $39.95, Amazon is going to take $10.18 out. And after our per unit cost, we’ll have $11.66 left over for ads. But just like our first product on this “what to sell on Amazon” list, ads are pricey for this product. $2.50 for exact and $1.39 for broad. Verdict: Another incredibly competitive product. You could end up spending tends of thousands of dollars and failing completely. This product is a loser. 1127 average units in sales per month. Wowzas! Another high sales category. Awesome. 318 average reviews. Bleh, high review counts, though. I removed a bunch of the above-100 reviews, but there were probably too many (I counted 11 on the front page). $18.47 average price. A good average price. So there could be some opportunity here. FBA fees are showing $4.41 – 6.87. Ouch! These things are heavy (duh, they’re weights). That’s really going to eat into our margins. Note: the $6.87 is on a version that weighs 4.5 lbs. Lots of versatility. One thing that I do like about this product is that there is a lot of variations on the product. So sales seem fairly spread out. I was hoping that these products would be the one, but already there’s a couple red flags here. Let’s look at costs. Surprisingly, they’re not very expensive to manufacture! I’m seeing about $2 – $3 on Alibaba. OnPallet.com shows us that we can fit a little over 400 of these onto a pallet. Notice how sales stay pretty high, but average price goes way down? That means that customers are willing to overlook the number of reviews for a cheaper price. Still, average reviews are 42. And if you look closely, those with reviews less than 50 still aren’t cracking 300 sales per month. So for our purposes, let’s order three months worth of units, so 750 based on the smaller sellers in the above screenshot. Keyword Scout says we need to giveaway 21 units per day to compete, so that’s another 210 for a total order of 960. That means we’ll have three pallets worth of stuff. I’m guessing that’ll run us about $2400 in shipping charges, or $2.50 per unit. If we sell our weights for $14.95 (remember how the average price went down when we took out reviews? ), Amazon is going to take $6.65. After we subtract our costs, that leaves us with a measly $2.99 for ads. I don’t have to check Keyword Scout to know that this product probably won’t make it. Verdict: Another competitive product with high FBA fees. This product is a loser. 570 average reviews. High competition. Nearly every listing on the front page that’s not a sponsored ad has more than 300 reviews. $19.72 average price. A good average price. But we won’t be able to pack in too many ads here. FBA fees are showing $2.99. They’re small and lightweight. By now, you should probably already know that this product isn’t so hot. No reason to price it out. Verdict: Another competitive product.. This product is a loser. Dave, why show us losing products? There’s a couple reasons why I wanted to show off these products on the What to Sell on Amazon Series. First, weight lifting is obviously going to be a popular category. A lot of sellers understand how important it is to stay in good health, and probably already own many of these products. So they’ll naturally gravitate to them. And the data shows that with the incredibly high competition. Next, all of these products are “fool’s gold.” A lot of new sellers will see the high sales number and think it’s a dynamite product. But then, when their products hit Amazon and they fail to make sales, they aren’t sure why. As you can see, nearly all of the ad costs–HSA, Exact, and Broad–are pretty high. We could have saved a lot of time just looking there. Tremendous contents are very helpful. Please investigate FBA handling fee is increase since Feb 2018. Yeah, it’s weird. Both our calc and Amazon’s calc are still showing $2.99. I’ll make a mention to our devs about it. It has an opportunity score of 8 and other variations offer opportunity score of 7. The data in JS Chrome Extension seems solid but you’re the expert. Anyways, hope you catch this suggestion and review it.